Falling into Place by Amy Zhang. Greenwillow Books, an imprint of HarperCollins Publishers. 2014. Review copy from publisher. The Plot: Liz Emerson, a high school junior, has crashed her car into a tree. She planned it, oh so carefully, to look like an accident. Now, as she lies in the hospital, hovering between life and death, Falling Into Place examines just what led her to that fateful moment. The Good: Falling Into Place has some seriously beautiful writing. I dog-eared (yes, dog-eared, don't tell) so many pages to mark passages where the language knocked me off my feet. "But that afternoon, in the abandoned field by the elementary school, Liz pretended that they were. In love. She lied to herself. Her world was almost beautiful. She didn't care that it was false." "Had the world always been like this? Why had it seemed so much kinder when she was younger? Why had it ever seemed beautiful?" In some ways, Falling Into Place is the mirror-image of Thirteen Reasons Why by Jay Asher. In Thirteen Reasons Why, Hannah explains her suicide by naming the people who hurt her, who let her down, her gave her no reason to live. Liz's story, also is a list of the reasons she gives herself for aiming her car at a tree... except her reasons are not things done to her. No, Liz's reasons are the things she did to others. A small aside: if you don't like any spoilers, go no further. Because my conversation will be mainly about the characters and who they are, and aren't, and for some that may be too much. Liz is the type that hurts people because she can. Because she feels it's better to hurt others first, before they can hurt her. Because she has some own deep childhood wounds -- a father who dies tragically, a distant mother who cannot connect either emotionally or physically with her only child. She is, inside, a hurt and jealous child: "It made her remember that there had once been a time when she was in love with the sunshine and the wind and each brief flight. It was like watching the sky change colors, his playing. And then it made her jealous, because Liz Emerson was never at peace like that. Not really. Not anymore." Liz both recognizes what she does and hates what she does yet cannot stop herself; she knows she does hateful things but does nothing to stop or make amends. She thinks she cannot fix what she does, so she doesn't even try. Instead, her solution is to end herself. "She looked around and saw all of the broken things in her wake, and then she looked inside herself and saw the spidering cracks from the weight of all the things she had done. She hated what she was and didn't know how to change, and half an hour before she drove her car off the road, she that despite all of that, she didn't have enough force to stop the world from turning. But she had enough to stop her own." And... despite the glimpse into who Liz is, and seeing those who both love her and forgive her, despite not wanting her dead, I find I cannot feel much for Liz. I feel for those who she breaks: there's at least one suicide, plus a handful of teens whose lives get sidelined with pregnancy, drug use, failures. It's nice that we see at least one of her victims put aside Liz's actions and words, see her vulnerability, forgive her, and get on with his own life instead of letting Liz ruin his whole future -- but it wasn't a real balance. Not to me. And Liz herself had nothing to do with it. One of her good friends thinks, "she doesn't remember when she turned into such an awful human being" and the friend is thinking about herself, but it could be about Liz, and the thing is -- they are awful. And they feel bad about it, when it all comes crashing down....but where do they go after that? These are the teens who I hope against hope that the real life teens I know never, ever encounter. And that if they do -- they are the type who don't care what the Lizs of the world think or do. What is frustrating about Liz is the obvious: her world, the world she wants to escape, is her own creation. She sees a cruel world because of who she is; and that Liz has shaped her reality to be her is something she doesn't recognize. She doesn't see that she can stop it by changing how she sees the world: by looking, once more, for the beauty she saw as a child. 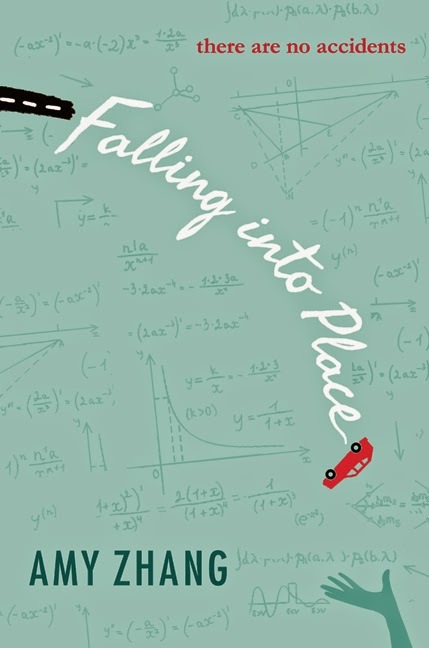 But what matters about Falling into Place is not what Liz learns or does not -- it's what the reader figures out. That the reader realizes, like one of Liz's targets, that just because someone like Liz is "never careful with her life or anyone else's, and in her disregard was a coldness, a deep cruelty, a willingness to destroy anyone, everyone", there is no reason to let Liz destroy everything: "he found that there were still beautiful things in the world, and nothing could ever change that." What the reader can also see, as Liz's full life comes into view, that Liz's world is also the sum of her own choices, her own times of going for cruelty and power instead of understanding and kindness. What also matters about Falling into Place is the language. It's beautiful writing, that makes the ugliness more bearable -- much like Liz herself looks for beauty, yearns for it. I look for the beauty in Falling into Place. And I find it, in how the story was told. In how the pieces fall into place. And how, finally -- I do find, underneath it all, that I have sympathy for Liz, after all. In how she and her world spun so far out of her control that she felt like there was only one answer. Other reviews: Scott Reads It; The Perpetual Page-Turner; Queen Ella Bee Reads. Sounds interesting. I'm interested particularly since Greenwillow publishes it -- I've found they publish a lot of really great stuff. You have expressed very nicely all of the things I found to be strengths about this book too. The writing is so beautiful and I can't wait to read more from this author. (I can't believe she's as young as she is.) I did have a pretty major issue with it as a whole that that kept me from really loving it, but it is more of a personal style complaint than anything.